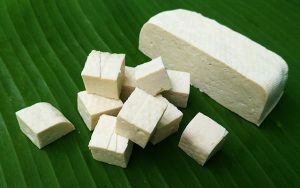 Tofu, more commonly known as bean curd, is a byproduct of soya. Tofu is produced by curdling fresh soya milk and then pressing it into a solid block, a process similar to curdling and solidifying milk into cheese. According to an article in BBCGoodFood.com, it is believed that tofu was first introduced in China some 2,000 years ago by a cook who accidentally curdled fresh soya milk using a seaweed. It was later introduced in Japan in the eighth century. An increased interest on healthy eating during the 1960s led to the introduction of tofu in Western nations. Because it is commonly used as an animal protein substitute, tofu is known to slash bad cholesterol levels. Tofu is also found to contain high levels of isoflavones that curb blood vessel inflammation and promote blood vessel elasticity. This in turn reduces the risk of hypertension and atherosclerosis. In fact, a previous study reveals that taking 50 grams of soy protein per day may significantly reduce blood fat levels and lower heart disease risk by up to 10 percent. Likewise, tofu consumption is linked to lower odds of developing certain types of cancer. Genistein, an isoflavone found in soy, is found to contain antioxidant properties that fend off cancer cell growth. Consuming moderate amounts of whole soy food is known to reduce the risk of breast cancer. Regular soy intake is touted to inhibit breast cancer recurrence as well. Previous analyses also show that men who have higher soy intake are 32 to 52 percent less likely to develop prostate cancer. In addition, consuming tofu may stave off kidney disease in patients with type-2 diabetes. In fact, a 2004 study revealed that diabetes patients who ate only soy protein in their diet excreted less protein in their urine compared with those who consumed animal protein. “The findings indicate that isolated soy protein consumption improves several markers that may be beneficial for type 2 diabetic patients with nephropathy [damage to the kidney],” the researchers wrote in JN.Nutrition.org. Aside from this, another study found that healthy older women who took 100 grams of soy isoflavones daily slashed their blood sugar levels by 15 percent and insulin levels by 23 percent. In yet another study, soy isoflavones were found to boost insulin sensitivity. Furthermore, tofu is found to promote bone health and prevent osteoporosis and liver damage at bay. The superfood is also touted to boost skin elasticity and brain function. Additionally, consuming tofu may induce weight loss and reduce menopause symptoms such as hot flashes. Tofu is specifically beneficial to the heart and the circulatory, digestive, and skeletal systems. Likewise, the superfood supports the brain, skin, and female reproductive system. Tofu is a staple in Thai and Chinese cuisines, and is primarily used as a meat substitute. Being a versatile ingredient, tofu can be incorporated in a variety of other recipes such as stir fries, salads and soups. A compilation curated by Taste.com features some of the most sumptuous tofu dishes. Tofu prevents heart disease, cancer, and diabetes. Tofu bolsters weight loss, bone health, and skin condition. Tofu supports the circulatory, digestive, and skeletal systems. Tofu is beneficial to the the brain, skin, and female reproductive system.